Some artists are more reflective than others. On their website, Blitzen Trapper have provided a handy essay that discusses the band’s development, the placement of their new album in relation to the rest of their work, and the specific ethos they’re trying to capture here. For anyone taking Blitzen Trapper 101, it’s the ideal exam primer. So, we’re told, their previous release, VII, was “a futuristic hip-hop/country-rock hybrid”, or My Beautiful Dark Twisted Americana Fantasy, as it’s otherwise known. On Across This Land, though, they’re “back to that rock thing again”. And very welcome they are too. The influences are easy to spot. There’s a lovely Neil Young harmonica on ‘Let The Cards Fall’. A vibe that’s reminiscent of The Eagles on ‘Lonesome Road’. And some decidedly Springsteenesque sounds and sentiments on ‘Cadillac Road’. While in some hands it would all end up a little derivative, here it remains fresh. Witness ‘Nights Were Made For Love’, which includes both a great Allman Brothers guitar riff and some Foreigner-style spangly synths. Blitzen Trapper are an honest hard-working band. They’re on the road a lot and they’re not afraid to do something a little special when they’re out there, witness their excellent full cover of Harvest earlier in the year. In the studio, they have the musical chops and the song-writing ability to craft a bunch of great songs. But All Across This Land is more than that. It’s a spirit. An ideal. An ethos. And there’s a fine essay available on their website if you’re doing Blitzen Trapper Studies and need a quick cheat sheet. 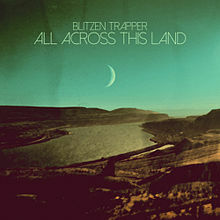 Posted in Blitzen Trapper and tagged as Blitzen Trapper, Music, Review.